Engineers of the Nigerian Army will ensure the removal of Improvised Explosive Devices (IEDs) planted by insurgents in the restive northeast region, a top officer said on Thursday. Maj. Gen. Nasiru Muazu, General Officer Commanding (GOC), 2 Division, said this in southwest city of Ibadan, while declaring the opening of a Conference to Strategies on Ways of Clearing IEDs planted by Boko Haram insurgents. 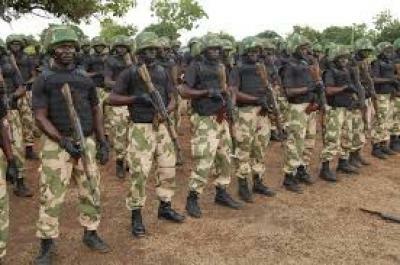 The military commander told his audience that the fight against insurgency was ongoing, urging Nigerians to support the armed forces by providing necessary information about the hideouts of the insurgents and their activities. The Nigerian Army on Wednesday confirmed the arrest of the mastermind of the two recent bomb and gun attacks in Jos and Zaria towns of Plateau and Kaduna states, respectively. On Sunday, July 5, suspected Boko Haram terrorists carried out coordinated bomb and gun attacks on worshipers at Yan Taya mosque, Dilimi Street, Jos. Another attack was unleashed on Shagalinku Restaurant, along Bauchi Road, Jos, which led to the death of over 48 persons, injuring several other persons and destruction of property.